Last night, I attended the CBCA Vic Clayton’s night where speakers talk about the current titles that they love, and that they think are worthy of consideration for the annual CBCA Book of the Year Awards. It’s always inspiring to hear people talk about the books that move, entertain, inform and engage them. I was thrilled to see ‘Meet the Anzacs’ on the Crichton display (for Max Berry’s illustrations) and on the Eve Pownall display with ‘Emu’. 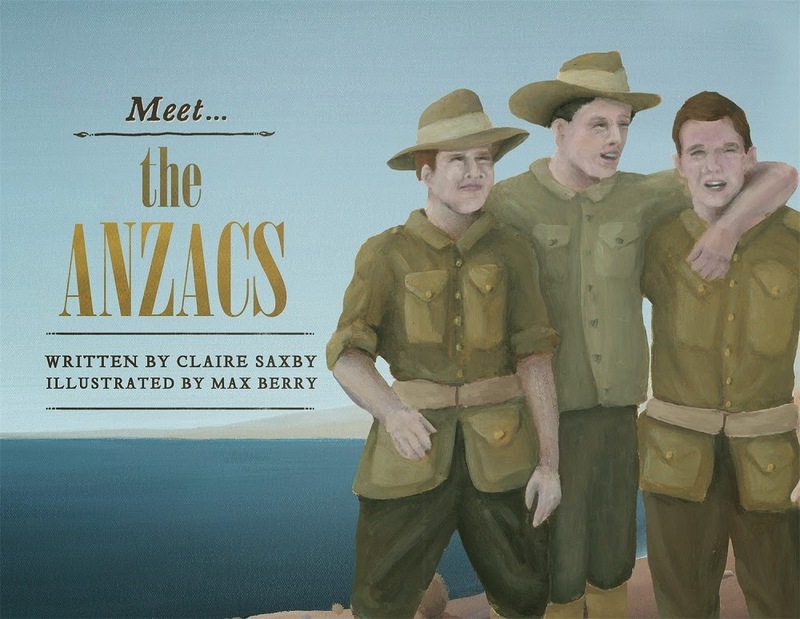 And this morning, Philippa Werry is hosting me at her ‘Children’s War Books’ blog, reviewing ‘Meet the Anzacs’ and interviewing me about the writing of. 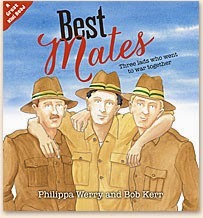 Shortly, Philippa will be visiting me to talk about the similarity in the covers for our Anzac picture books and other elements of writing about war. Before Christmas, I visited the Penguin Random House offices to record an interview about the writing of ‘Meet the Anzacs’. This week, following amazing work by the RH team, there’s a book trailer! 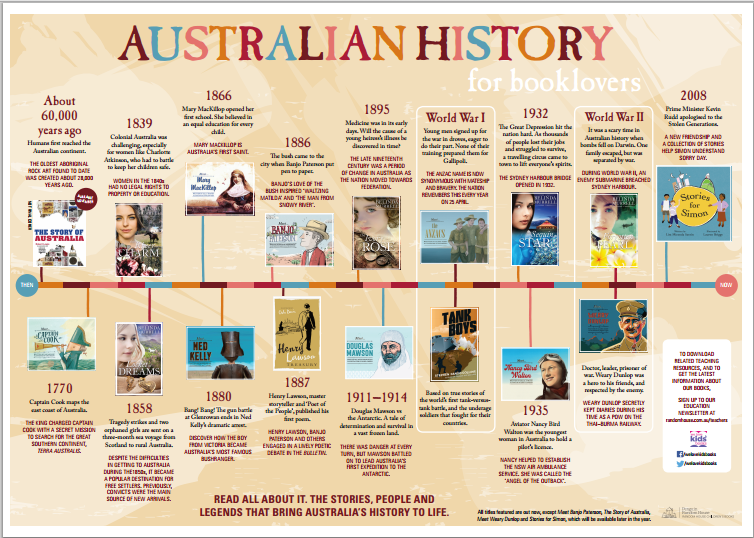 This poster went out this week inside the book industry magazine ‘Magpies’ to schools and libraries. Lovely to see that my soon-to-be-released ‘Meet Weary Dunlop’ is also included. Thanks RH! Today, I welcome my friend, Lorraine Marwood, to my blog to talk about her new poetry collection for children. Her visit is part of a blog tour to celebrate the release of ‘Celebrating Australia’ and other blog-stops are listed at the bottom of this post. Lorraine writes and teaches poetry for both children and adults. She is a multi-published author of both prose and poetry, including Prime Ministers’ Award winner ‘Star Jumps’. She has long been my poetry mentor. I love her work and value her insights. 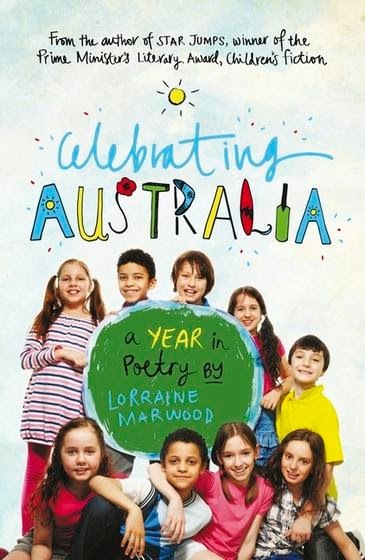 ‘Celebrating Australia’ is a collection of poems for children encompassing different ways and days that Australians celebrate. Some of the celebrations will be familiar to most readers, others less so. Did you know about World Animal Day? Or World Oceans Day? What is your favourite poem in this collection and why? Now that is a challenging question. I could say my favourite poem to write was “Talk like a pirate day” because it was such a lot of rollicking fun and a gift to make into a written chuckle. But the favourite poem has to be the unexpected one- the Nativity poem. This topic was not my choosing. My editors said ‘write a nativity poem from a child’s point of view’ and along came a boy and his all-knowing friend Tiff who keeps telling him what to think about different aspects of the nativity play. The boy is the donkey in the play and is like us looking in on the nativity as it unfolds. From bewilderment to final reverence the boy undergoes a gentle transformation and for me the benchmark was showing the significance of Christmas without any preachy aspects. To add to the mystery of the writing process, my own grandson, as the collection went to press, was chosen to be the donkey in his preschool’s nativity play! Wow! A shivery, tingly feeling which poetry should also deliver. Which poem was the most challenging to write and why? Definitely ‘Labour day’- what can be said other than dry slogans? A different scenario to an actual labour day weekend, when the enjoyment is tangible. but payment remaining the same. How do you see this collection being valuable in a classroom? I see it becoming an entry point for teachers to share each celebration as the time approaches and to find common ground in what the celebration is to them. The class could then add to the poem with their own take on what form the celebration embraces in their family. 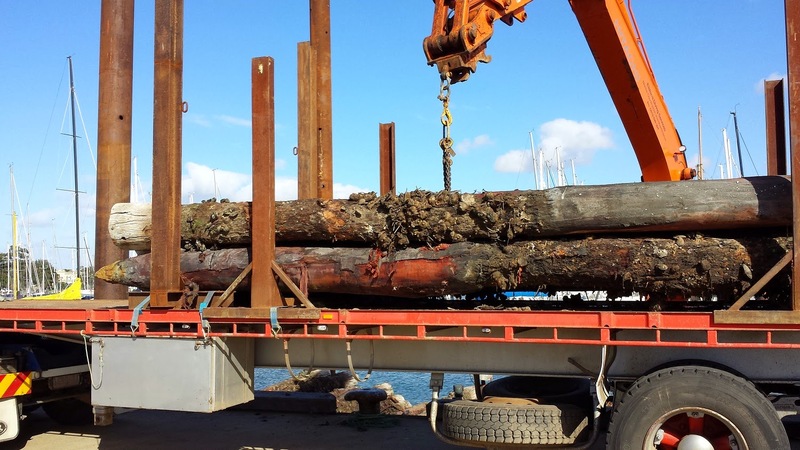 It can become a stepping point for an exploration of an historical event- for example ‘Anzac Day’, ‘Halloween’. Of course it embraces multi – cultural aspects of our Australian life and each new celebration like ‘Moon festival’ or ‘Ramadan’ can be studied for cultural significance. The book also explores some prominent school events like sports carnivals, first day, graduation, grandparents’ day and so on. I’m sure different schools would have significant ‘celebrations’ that are uniquely their own and can be written into poetry. Which is your favourite celebration? It would have to be ‘Christmas’ because it is so encompassing in many ways, I get a chance to share a special time with my family, to give and to write and contact friends and acquaintances I might only do at Christmas time. There has always been a joy and an anticipation that is rarely captured for me in any other celebration. What is the best part of being a poet? The unexpected lines, images and emotions that come through in a poem when I am least expecting it. Poetry becomes a wonderful way of recording the little daily celebrations of life and when joined together become the some total of my outlook and joy in my life’s journey. What is the most challenging part of being a poet? The written word stage has such a small footing for poetry, yet it can touch children and adults in a way that prose can’t. In other words poetry has little big screen publicity and therefore the monetary rewards of a poet are meager. What can poetry do that prose can’t? Ah, this leads neatly on from the last question and I have to validate my statement. 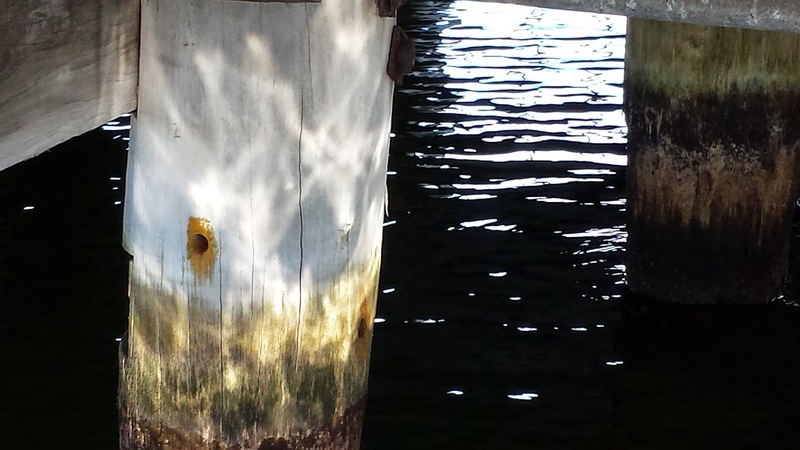 · poetry dances and has a resonance that can deliver meaning in succinct and vibrant ways that prose is unable to do. Just look at the amount of times a poem is read at a significant milestone in life like marriage, an achievement, a family gathering, a funeral, a love note, an encouragement, a prayer. I hope my collection might offer many readings at these special times. · poetry can shine the spotlight on a small happening, a small joy or small detail and bring into prominence the things we might take for granted. Poetry makes you ‘stop and smell the roses’- ah I used a cliché!!!! Thanks Claire for these great questions. I always appreciate your support as a poet, author and friend. Always a pleasure Lorraine. Lovely to have you visit. WAIT! I nearly forgot. As part of this blog tour, Lorraine suggested bloggers write their own poem based on one of her poetry strategies. (the strategy can be found on Jackie’s and on Kat’s blogs – links below). 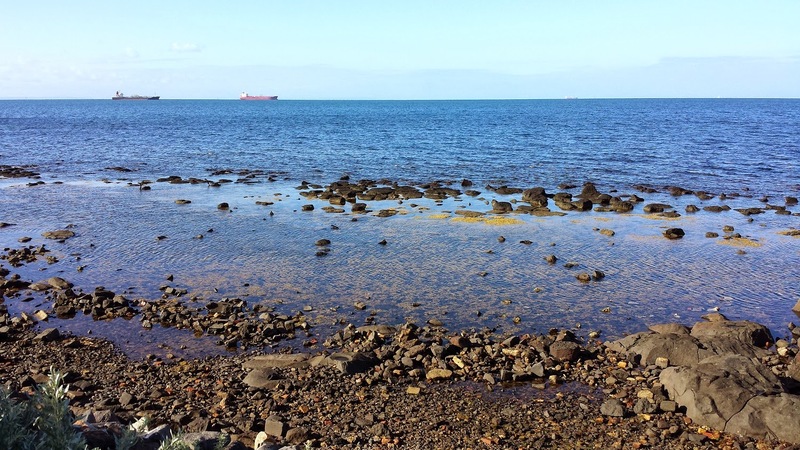 Aggh – it wasn’t easy! In fact there was plenty of gnashing and wailing (but then that’s normal with many poems and early stories) before I came up with my poem. It’s not perfect, but I’m grateful, as always, for being pushed outside my comfort zone. 6 March: Janeen Brian: http://janeenbrian.com/blog/ Topic: How you create for the creators: how you create ideas to excite children and adults to write poems of their own. 9 March: Alphabet Soup ; www.alphabetsoup.net.au Topic: Writing a class poem- the results!